Getting On Air (How to Find a Job in Radio... and Keep it) By David Hoffman David Hoffman's first encounter with radio was at Junior School when the Headmaster, Mr Oldfield, asked him to organise a school radio station, to read stories, poetry and anything else that could be conjured up as educational entertainment. Some ten years later, he went on to be the founder of Radio Nightingale, the hospital radio service for Rotherham. Since then, he has become a full time radio professional and has hosted shows on around thirty different radio stations, locally, nationally and now, courtesy of the internet, globally. More recently, he became involved with a software supplier, Barrcode Ltd, and helped adapt their radio playout system into BCX-DJ, aimed at personality and party DJs. 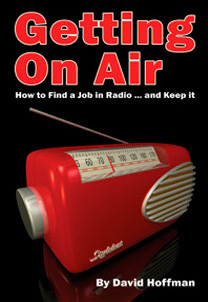 This book is for hospital and community radio presenters, mobile DJs and in fact anyone with an interest in radio. David starts by providing an interesting history of radio before providing loads of advice for prospective presenters. The whole book is written in a very readable style and is interlaced with lots of humorous anecdotes from David's extensive radio career. "In a world of media mumbo-jumbo, David's book is a refreshingly honest account of the reality of radio today! A must-read for all those who fancy spinning the discs - this book entertainingly sorts the 'do-s' from the 'don't you dares!'" "A thoroughly comprehensive guide that really gets under the skin of British commercial radio. David's wealth of experience and depth of knowledge provides indispensable advice for any aspiring music presenter." "Witty & informative! An incredibly accurate insight into the world of radio!"